Pure Love is an ultra chunky yarn made from 100% family-raised, undyed alpaca fiber. Each skein brings together the beauty of an entire herd with the spectrum of natural alpaca colors variegated into a single skein. 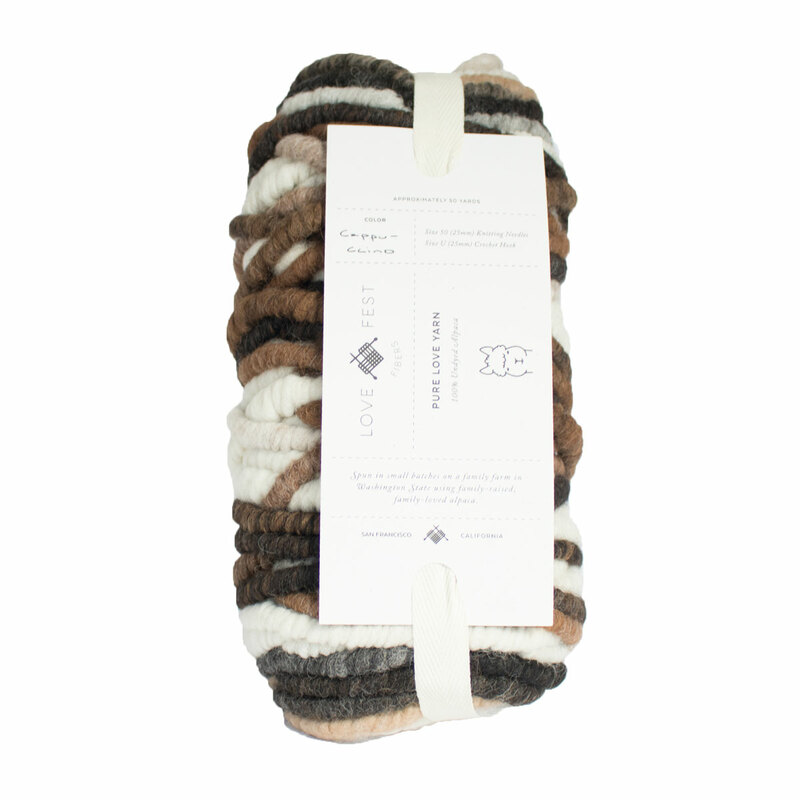 Both color combinations create natural striping, especially when using stockinette stitch. Pure Love's super bulky weight makes it a dream to work with, a full size throw knits up in no time on size US 50 needles, US U crochet hook, or even just your arms! Love Fest Fibers ReLove Alpaca Yarn is a similar yarn: alpaca, dry clean, super bulky (11 sts or less/4 in), 1 sts / inch, 510 gram, on size 50 US needles, and 50 yards. You may also like Love Fest Fibers ReLove Merino Yarn, which is another similar yarn: dry clean, super bulky (11 sts or less/4 in), 1 sts / inch, 510 gram, on size 50 US needles, and 50 yards. What about yarn that have the same look and feel? Find more yarn that is undyed, a slubby texture, and sheds. Hopefully our suggested project ideas for Love Fest Fibers Pure Love Alpaca Yarn can help you come up with your next exciting new project idea!